Known for keeping things popping on the dancefloor, SMOG Records returns to center stage with this massive debut from a new-school face already causing a ruckus. 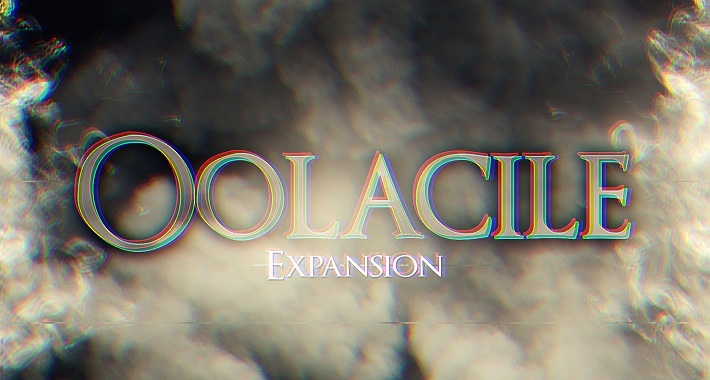 We’re talking about Oolacile and his dark and heavy Expansion EP about to drop on September 21 (lock in your pre-order here). Centered on seven chest-banging dubstep cuts sure to have all the heads up on the rails banging it out, it’s the title cut that brings it all home for us. If industrial head-twisting, face-melting, glitched-out killers are your thing then be sure to check the exclusive first look at “Expansion” below alongside an in-depth chat with the 21-year-old from Oceanside straight up taking over! Give us a quick sketch of who you are, where you’re from, and how bass music and heavy dubstep in particular came into your world. I started playing guitar when I was 12 and eventually got into playing heavy metal with various bands. A friend of mine showed me electronic music when I was younger, acts like Basshunter, Pendulum, etc. I really liked it but my heart was still in metal because I really like the heaviness and the complexity of the music. That all changed when I heard the Ministry of Sound dubstep compilation in 2011 as it really connected the two worlds together for me, and I knew this was something I wanted to get involved in. From there I just got to work figuring out how I could make my own dubstep and drum & bass music. Talk a bit about your name and the meaning behind it. I’m assuming this is from Dark Souls, yeah? For those who have never played, fill us in on the mythology of it and how you see it relating to your signature sound. Dark, unholy, and apocalyptic are words that come to mind. Yeah, you definitely hit the nail on the head. Oolacile is a location in the video game series. It’s a location that was once peaceful but was consumed by dark magic, the abyss. I think the name is a good representation of my sound. My music is definitely dark and mystical just like the game and the lore surrounding the name Oolacile. You’ve been coming up hard this past year. Your “Leave It Behind” remix was fire and now this massive seven-track EP on SMOG! Give us a sense of how the Expansion project came together and what kind of vibes we should be bracing ourselves for on there. First off, I really want to thank everyone who has supported me thus far, either from reaching out to me, playing my music, spreading the word, and everything in between. I have a really hard time reaching out and marketing myself. It has been amazing to have people like my managers and other artists help push me in the right direction. A lot of the tracks on this EP are actually slightly older tunes that I had been saving to release on a bigger label like SMOG. My manager was at a party with 12th Planet and had showed him some of my music. Shortly after 12th and I linked up on Twitter. He wanted stuff for [their album compilation series] Battle Royale Vol 2, so I sent him all the music I had, not just for him to sign but also hopefully to play out. He decided on putting the collab I did with Uber called “Disabled” on the compilation album, but he also told me he wanted me to do an EP with him in the future and to work on a tune! I took the train up to Los Angeles a few times to stay with him and we wrote “Creepers” together. Once that was done we started setting up the EP for release. The EP itself is seven songs, three of which are collabs and two that feature vocalist. I’m really happy with the flows and lyrics the vocalists, Jumanji and Boogie T. came up with. We also have tunes with the legendary 12th Planet, the genius MurDa, and the mad man Savory. All the songs are dubstep tunes with the exception of “Manipulator”—which is a drumstep/glitchhop tune—but they all have a very distinct sound and character. For example, “Crooked” is a more riddim style tune and “Creepers” is a heavy, more violent sounding tune while the song with MurDa is an experimental sound design flex tune. Any other artists out there we should be looking out for? I absolutely love this question because it allows me to shine some light on some insanely talented and underrated producers. First of all, we have some of my homies from Southern California who are just absolutely killing it all in their own way. Sudden Death has a very unique sound and mixdown topped off with insanely creative and dark melodic intros. Uber has designed some of the best dubstep growls I have ever heard and comes up with super catchy yet complex flows. Yakz is a guy who was known for making riddim but is branching into more types of dubstep and has been doing a great job with his newest productions. I have a buddy, Ravachol, who actually lives down the street from me and hasn’t had a computer for a long time but just recently got one. This man is one of the gnarliest brostep producers I’ve heard since Virtual Riot and I’m really excited for him to start uploading music again. And that’s just Southern California! There are a couple guys in the Netherlands right now, like Kadaver and Madcore, who are really doing a great job advancing the sound forward. We also have MurDa and Samplifire who are just completely insane and everything they write is absolutely gold. We also have guys like Trilla and the list just goes on; so much talent in dubstep right now. What about for all the heads out there hoping to step up their own game in the studio? Any advice you wished you’d received when you were just starting out? All I can say is just be yourself and stay unique. It’s fine to learn from other producers, trying to recreate sounds is a good way to learn sound design, copying flows is a good way to learn arrangement. Keep in mind that these things directly inspired or copied should not be used in your own original tunes but should instead be utilized as stepping stones to bettering your understanding of production. Pretty much anytime someone tries to copy something someone else has already done, it just ends up sounding like a crappier version of what they were copying. The way labels are going to notice you and the way DJs are going to start playing your tunes is by creating something that they can’t get anywhere else. It will literally make you a precious commodity. In short, be unique and find your own special sound that no one else has.